The Arabian Sea Region Oil & Gas Summit organised by IRN, will gather the international and national oil and gas industry to discuss and address the investment opportunities both on countrywide and regional level. Many developments are taking place these days in the Arabian Sea countries with agreements signed or discussed on various oil and gas projects creating major investment options. These examples highlight the various investment opportunities of the Arabian Sea region, where many more exist and are open to international interest. 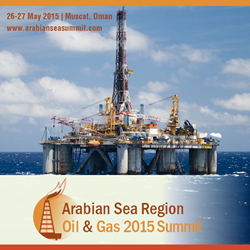 The Arabian Sea Region Oil & Gas Summit, will gather the international and national oil and gas industry to discuss and address the options both on countrywide and regional level. The Summit will be held on 26th-27th May in the 5* InterContinental Hotel Muscat, Oman with the official support and endorsement of the Minister of Oil & Gas of the Sultanate of Oman focusing on the oil and gas business in Oman, India, Iran, Pakistan, Somalia, Yemen and Sri Lanka. General Managers, Chairmen, Presidents and Executive Directors from the regional oil players and VP Business Development as well as Country Managers and Heads of Exploration from international oil majors have already confirmed their presence in the speaker line-up. The Petroleum Federation of India, the Middle East Association and the International Gas Association – CEDIGAZ act as supporters of the Summit. Solarlite, the company that provides environmentally friendly solution to operators of mature fields, is a gold sponsor of the Summit. More information about the Summit can be found on http://www.arabianseasummit.com and about the organisers, IRN, at http://www.irn-international.com. On the Summit’s website, it’s also possible to subscribe to the Summit’s newsletters. IRN offers daily updates about the project in their Linkedin Group - The Oil & Gas Network and their Twitter account - @IRN_OilandGas. *Sources: "Gas pipeline connecting Oman and Iran to India discussed in tripartite talks", Times of Oman, 02.03.2015 | "Energy deal: Moscow to lend $2b for LNG pipeline", The Express Tribune, 18.04.2015 | "Indian delegation to visit Iran to discuss oil deals - sources", Reuters, 16.04.2015 | "Cairn India pulling out of fuel, gas explorations in Sri Lanka", 20.04.2015, AnaderanaBiz, | tribune.com.pk/story/870183/china-gets-40-year-management-rights-on-gwadar-port-access-to-arabian-sea/ "China gets 40-year management rights on Gwadar port, access to Arabian Sea", 15.04.2015, The Express Tribune.